Late last week, the Associated Press attempted to troll President Donald Trump by claiming that his decision to withdraw from the Paris Climate Accord "may speed up" damage to his organizations' properties in Florida and other low-lying areas because of a "climate change"-driven acceleration in rising sea levels — by 2100. At the Weather Channel's Weather.com Friday evening, writer Pam Wright seemed to relish that prospect, and presented it as if it's far more than a possibility. Sen. Marco Rubio expresses doubt that human activity is driving climate change and Bill Press, liberal radio talker and co-host of an early version of CNN's "Crossfire," labels him deranged. Just a matter of time before Press also labels Rubio as racist for this. Politico's Darren Goode surprisingly highlighted the skepticism of many on-air meteorologists in a Monday item about President Obama's interviews with "some of television's most popular celebrities — weather forecasters — to ratchet up the volume on the administration's latest scientific assessment of climate change." Goode pointed out that "not all broadcast meteorologists have been conducive to the climate science message." He returned convinced of his position, but a recent survey shows that among his fellow weathercasters, his view is in the minority. The survey by George Mason University and the University of Texas found that while more than half of TV weathercasters believe global warming is happening, less than a third say it is caused mostly by manmade carbon emissions. "A study released this year by researchers at Yale and George Mason found that 56 percent of Americans trusted weathercasters to tell them about global warming far more than they trusted other news media or public figures like former Vice President Al Gore." So wrote the New York Times's Leslie Kaufman in a rather surprising piece published Tuesday. A rather remarkable thing happened Thursday: a documentary highly skeptical of man's role in global warming was aired on broadcast television. 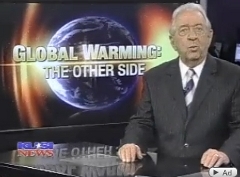 The program, "Global Warming - The Other Side," was created and hosted by John Coleman, the founder of The Weather Channel, and debuted on San Diego's independent television station KUSI. Readers should be familiar with Coleman as the man who not only called global warming "the greatest scam in history," but also advocated suing Nobel Laureate Al Gore to expose the fraud. Since calling global warming "the greatest scam in history," the founder of The Weather Channel John Coleman has been an outspoken advocate for climate realism. This weekend, Coleman posted at his KUSI-San Diego blog an "Open Letter to Environmentalists" challenging them to campaign for "environmental goals on the basis of their own merit" while urging alarmists to "[l]et go of the global warming frenzy before it leaves [them] discredited and embarrassed." 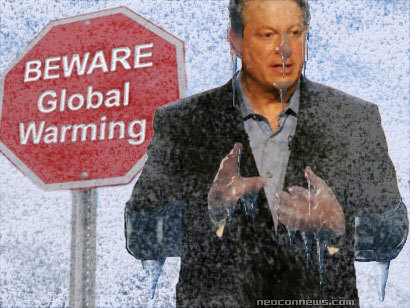 Al Gore has made a lot of money and publicity with his crusade against global warming. I have written in the past how this whole crusade seems to be based on a Big Lie, and its real purpose appears more intended to get global government so the rest of the world (ie. the United Nations) can gain control over the United States' many assets without having to go through the awkward exercise of actually getting a their authority recognized by the US Congress. However, there has been a backlash against the Gore Warming crusade (fueled partly by Gore's own hypocrisy in using large motorcades, private jets and his lavish lifestyle- none of which are designed to show others that he is serious about the entire issue. Not that the press has bothered to do any real reporting- they have fallen in line with Gore's crusade lock, stock and barrel- refusing to report on critics and making statements equating said critics with Nazis and other undesirables. However, the evidence is mounting that Gore and his global warming friends are no more accurate in their claims than Newsweek was in its new ice age campaign in the 1970s. By now most people are aware that the founder of The Weather Channel, John Coleman, said global warming is "the greatest scam in history" last November. The Center for American Progress's Think Progress blog attacked a Noel Sheppard post on NewsBusters and a handful of other conservative blogs today. Their crime? Citing climate change comments uttered by a weatherman. The conservative blogosphere is pushing Coleman's junk science today. Matt Drudge links to NewsBusters' "marvelous" take on Coleman this morning. Red State [sic], Qando [sic], Sister Toldjah, and the Free Republic also join in by approvingly linking to Coleman's piece. The right wing should check Coleman's credentials before touting his "scientific" work. As Coleman admits, his "expertise" is in weather - not climate change science. In fact, he "has been a TV weatherman since he was a freshman in college in 1953."